Screentime / Nine Network. 2014. Executive Producers: Des Monaghan, Greg Haddrick, Jo Rooney, Andy Ryan. Original music score composed by: Burkhard Dallwitz. CD (ST) Sony Music. 88843045472. 2014. House Of Dreams. Bliss n Eso. Don’t Ever Want To Be Found. The Rubens. Where The Party’s At. Tonite Only. She Plays Up To You. Clairy Browne & The Bangin’ Rackettes. I Am Somebody. Bliss n Eso Featuring Nas. One Foot On The Grave. Graveyard Train. Under The Birdcage. The Cactus Channel. I’ll Be Fine. Clairy Browne & The Bangin’ Rackettes. The Colour Of Don Don. The Cactus Channel. Footy Footy. King Gizzard & The Lizard Wizard. In Ginocchio Da Te. Gianni Morandi. Law & Order. Burkhard Dallwitz. Friend Or Foe. Burkhard Dallwitz. No Going Back. Burkhard Dallwitz. 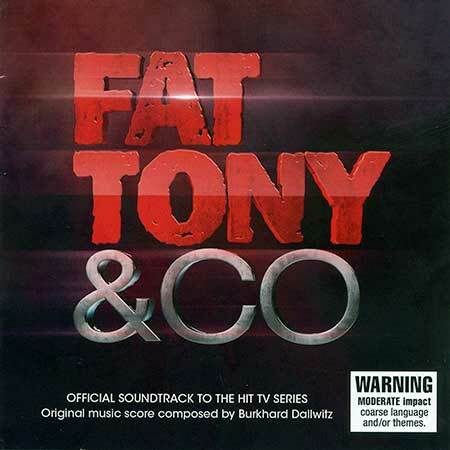 Fat Tony & Co Title Theme. Burkhard Dallwitz. Feelings Of Grief. Paul Kelly.